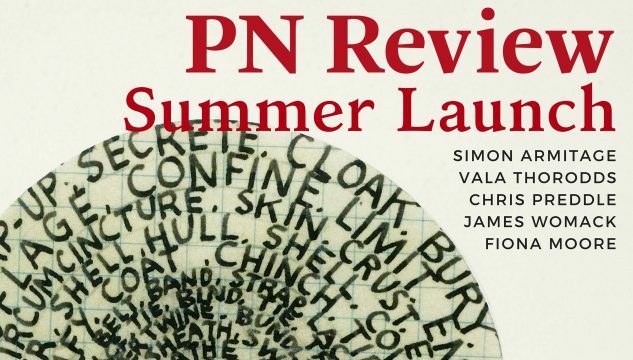 Castlefield Gallery is delighted to be hosting the Summer Launch of PN Review on Wednesday 18 July from 6:30pm, with readings from contributors Simon Armitage, Fiona Moore & Vala Thorodds, who will read from her translations of Icelandic poet Kristín Ómarsdóttir, & PN Review Prize winners James Womack & Chris Preddle. PN Review is a bi-monhtly literary journal launched in 1973. Simon Armitage was born in West Yorkshire and is Professor of Poetry at the University of Sheffield. A recipient of numerous prizes and awards, he has published eleven collections of poetry, including Seeing Stars (2010), Paper Aeroplane: Selected Poems 1989-2014 (2014) and his acclaimed translation of Sir Gawain and the Green Knight (2007). He also writes extensively for television and radio, and is the author of two novels and the non-fiction bestsellers All Points North (1998), Walking Home (2012) and Walking Away (2015). His theatre works include The Last Days of Troy, performed at Shakespeare’s Globe in 2014. In 2015 he was appointed Professor of Poetry at Oxford University. Fiona Moore‘s first collection The Distal Point has just been published byHappenStance Press and will be a PBS Autumn Recommendation. Fiona is co-editingMagma 72 on climate change. Read some of her poems in PN Review here. Vala Thorodds was born in Iceland and grew up in Reykjavík, upstate New York, and South Bend, Indiana. As a poet she has been nominated for the PEN New Voices Award (2014) and her poetry has been published various journals. A selection of her poems is published in the anthology New Poetries VII (Carcanet, 2018). Her English-language translations of Kristín Ómarsdóttir’s poetry, Waitress in Fall, is forthcoming in July 2018 – read two of the poems here at Granta. Kristín Ómarsdóttir is the author of seven collections of poetry, five books of short stories, seven novels, and half a dozen plays. Her novels have been translated into many languages including Swedish, French, and English. Her awards include the DV Cultural Award for Literature, the Icelandic Women’s Literature Prize, and the Icelandic national prize for playwright of the year. She has been nominated for the Icelandic Literary Award four times, as well as the Nordic Council Literary Prize. James Womack is a translator and poet who lives in Cambridge, where he teaches Spanish and English. His second collection, On Trust: A Book of Lies, was published in 2017. Read some of his poems in PN Review here. Chris Preddle has retired from library work to a green valley below the Pennines in West Yorkshire, beside Mag Brook. His third collection The May Figures is forthcoming from Eyewear; his second was Cattle Console Him (Waywiser, 2010). His work has appeared in Irish Pages, PN Review, The Poetry Review, Scintilla, The Shop, The Yellow Nib, and other British and Irish magazines, and in Little Star (US). He is translating the poems and songs of Sappho. Read a poem by Chris here.